You can be sure the gods of travel are smiling when you head to Paris in early November for two days and the weather is mostly sunny and the temperature about 66 degrees Fahrenheit. That is what our weekend in Paris, with students, was like! It had been a bit of a mess in preparation, as many more students wanted to go than were spaces available on the Eurostar we'd reserved, and as we thought we had a hostel but did not. 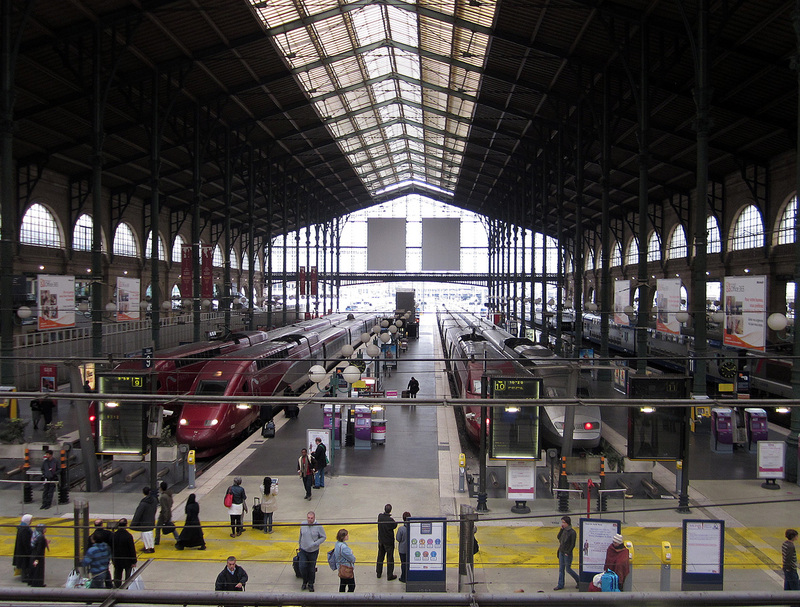 Solutions to all of the above and more were solved by the resourceful ICLC staff, however, and bright and early (hmmmm...it wasn't BRIGHT and early in London, though it was in gay Paree) we left St Pancras and arrived in Paris at the Gare du Nord a few hours later. After the others left their bags at the St Christopher's Inn Hostel and I left mine at the Hotel Altona (don't ask WHY I felt the need to stay elsewhere...or do -- I'm not telling anyway) we met up and started two parallel walks, Bill's an introduction to Paris, mine a French Revolution walk, meant for my own students, but happily joined by 12-14 others. 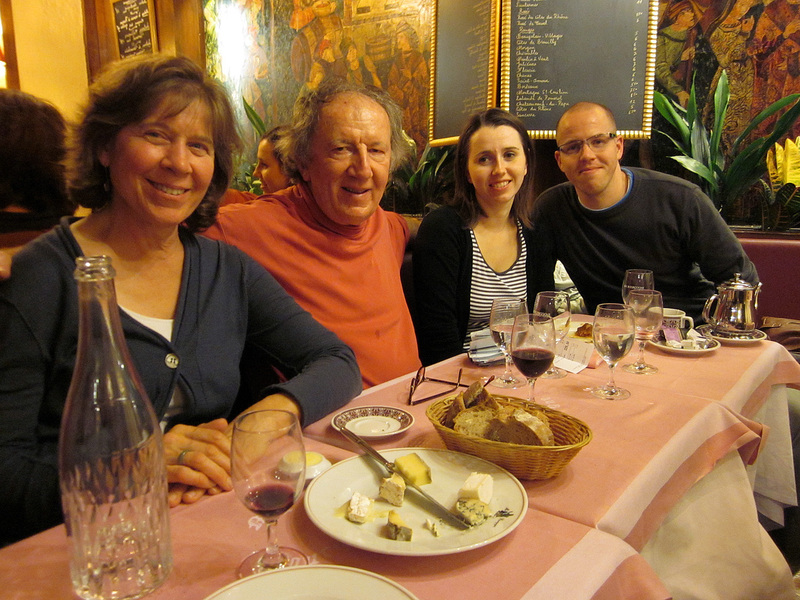 Bill and I took very similar paths so that students would not feel they missed anything, and the paths we took led us to several wonderful areas of Paris. 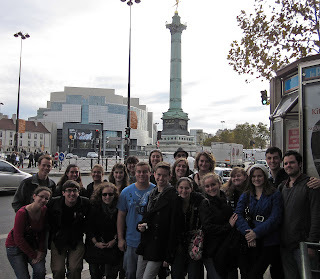 We started at the Place de la Bastille, the place (pronounced differently from the one with the capital P, in which the "a" sounds like "ah") where the French Revolution began. 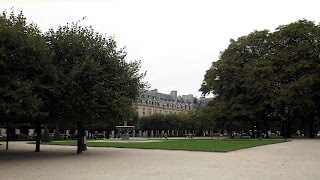 In fact the street we stood on once out of the Metro station was Blvd Beaumarchais, the writer of one of the first plays we read in the class, The Marriage of Figaro. 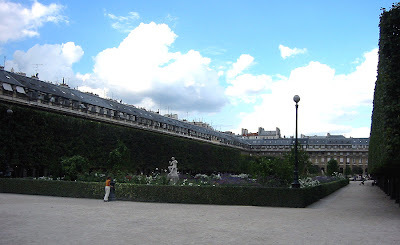 We strolled up Blvd Beaumarchais a few blocks to Rue Quatres Bourgeoises and turned left into the Marais district, one of the oldest in the city, and one of the most beautiful and exclusive, even today. Our first stop was the Place des Vosges -- not that this Place ("ah" again - following me?) had any great significance during the Revolution, but one doesn't just walk by one of the loveliest squares in Paris without comment. And anyway, the Victor Hugo house, now a museum, is located just off this classy Place (I leave it up to you how you pronounce the "a" in "classy" but I'd go with "ah" in this case), and Hugo wrote on the Revolution, certainly in Les Miserables, but more directly in my favorite novel by him: Ninety-Three, about the Vendee uprising during the Revolution. 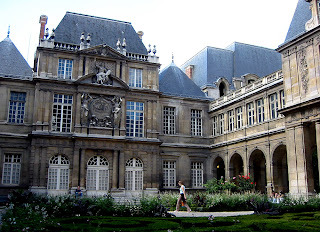 We continued down the Rue des Francs-Bourgeois to the Musee Carnavalet. 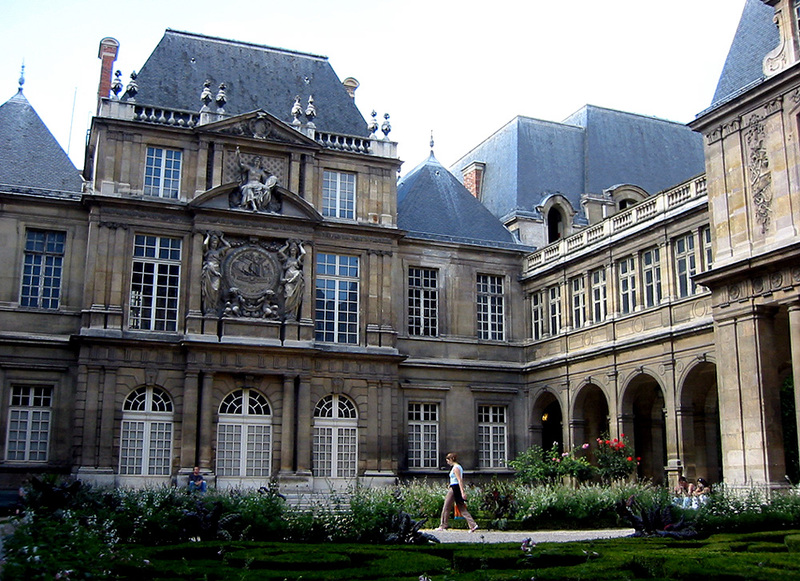 an imposing seventeenth century town house("Hotel" en Francaise) which is now home to the museum of the city of Paris. Almost the entire second floor (third floor to those of us from the U.S.) features artifacts, paintings, sculptures etc about the French Revolution. I would have loved to have taken the students in to this excellent and certainly pertinent, but time was at a premium, so I urged them to return, though I doubt any did - well, maybe on their next visit...I'd say I "rue" the fact that they probably did not, but you might think I was making a bad joke. 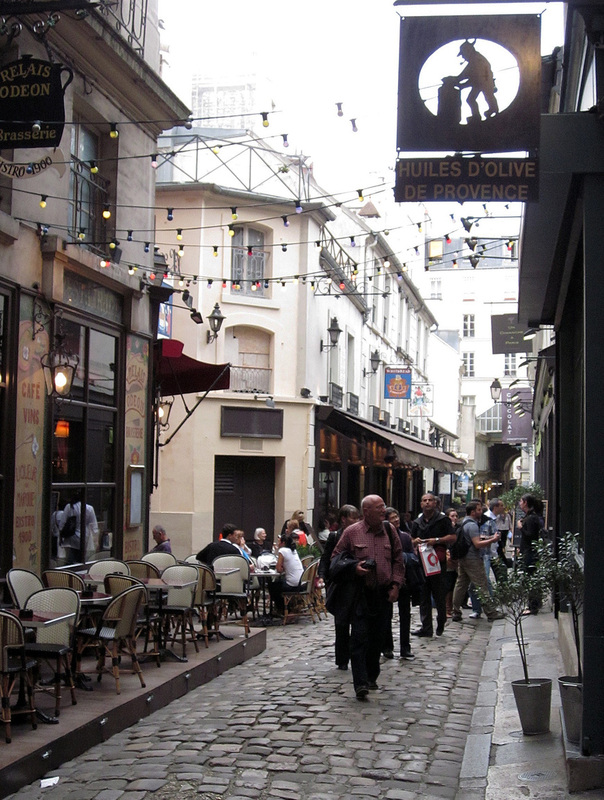 We turned left into the Rue Pavee, so called because it was one of the first roads in Paris to be paved, in the mid-fifteenth century. Here an historical marker notes the location of the La Force prison, one of the sites of the prison massacres in September 1792 and the site where the fictitious Charles Darnay from A Tale of Two Cities was imprisoned. 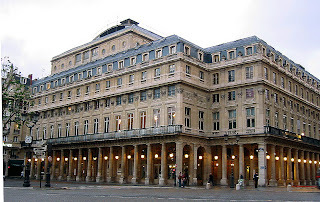 From the Rue Pavee we headed east to the Rue de Rivoli and from there to the Hotel de Ville, or the mayor's office in Paris. It figures in the Revolution as shortly after it began Louis XVI was made to greet the mayor there, as a citizen, not as a king. 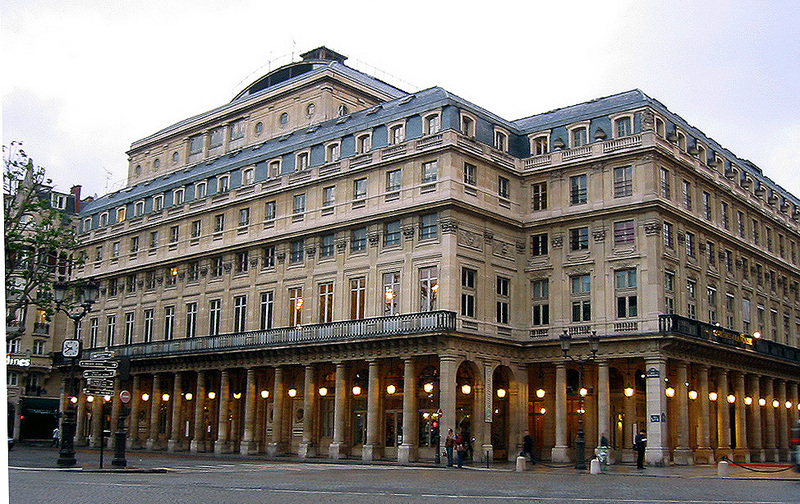 It's another imposing building, and sits just off the River Seine. 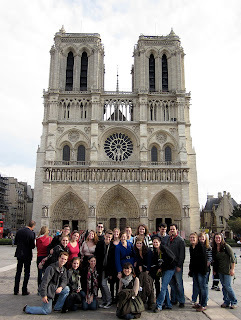 We crossed halfway over the Seine, to the Isle de la Cite, on which is located one of the most famous Parisian landmarks, the cathedral of Notre Dame. It too figures in the Revolution, as in 1793 it was reinvented as a Temple of Reason. Many Revolutionaries hated the Roman Catholic religion, not without cause as many of its priests and bishops had grown rich off the backs of the people, so it was turned into a site of secular worship, if you will. Notre Dame was the only stop where students had time to go in to see the magnificent gothic cathedral, as I'm fairly certain the students would have tarred and feathered me -- maybe even guillotined me! had I not let them enter. We stayed on the Isle de la Cite after Notre Dame just long enough for me to point out the Palais de Justice, part of which, the Conciergerie, was where many prisoners of the revolution, including Marie Antoinette, spent their very last night, before their locks were shorn and they were taken in carts to the Place de la Revolution, now the Place de la Concorde, to be guillotined. It is another site I'd have loved the students to wander through, but again, time was pressing, and there was also an admission fee, so we crossed Pont St Michel to the famous "rive gauche" or "left bank." 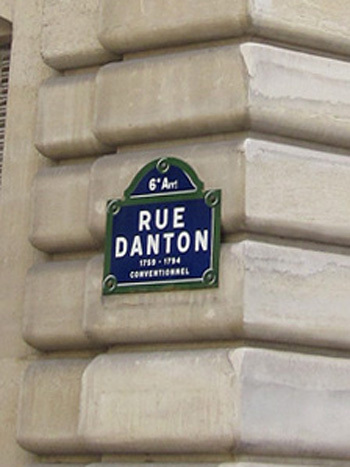 Off the famed Boulevard "San Mich" is a smaller street called Rue Danton, for one of the few heroes of the Revolution who is seen fit to be honored today by a road name. You'd have to look very hard, and even then you'd be disappointed, to find a Rue Marat, for example. Like many other Revolutionaries Marat became radicalized, resulting in many, many deaths, many, some would say all, needless. At any rate, where the Rue Danton hits another famous Boulevard, named St Germain you will see the Odeon Metro station -- just in front of it is a great statue of Danton (don't even bother to search for a statue of Marat), in a defiant, oratorical stance. 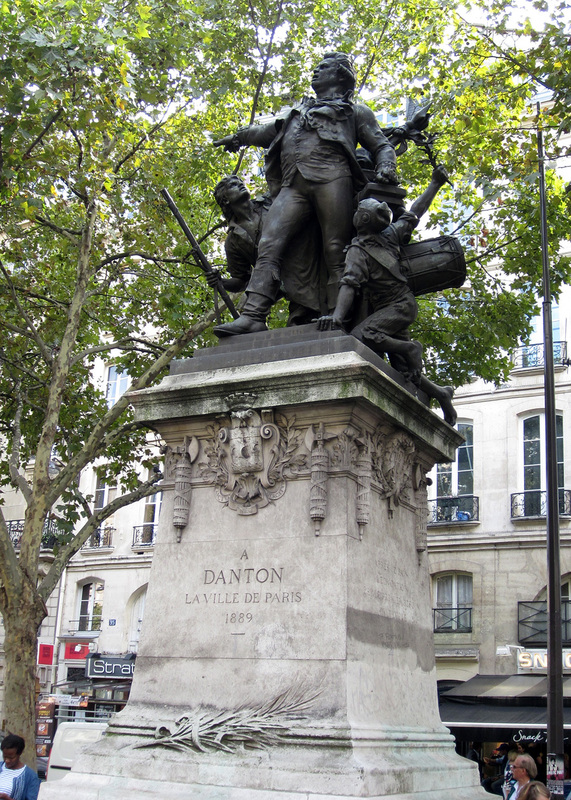 Danton seems to be looking across the street at a tiny alley whose historical value is much broader than its physical breadth or length. In this alley, called Cour de Commerce St Andre, Marat kept his printing press, Doctor Guillotin experimented on a new, humane system of execution by lopping off sheep heads, and the first Cafe in Paris, called the Cafe Procope, was the preferred coffee house of Voltaire, Rousseau, even Ben Franklin, and of the notorious Robespierre, another Revolutionary who is not much in evidence in the street signs or statuary of Paris today. We then headed back to the Seine, crossed it at the Pont des Arts, a pedestrian bridge known for its "love-locks" - pairs of lovers place a padlock (some combination locks, which seems a bit suspect to me) on the bridge, lock it and throw away the key, symbolizing that their love will last a lifetime, I suppose. Makes for a colorful bridge whatever you may think of the notion. 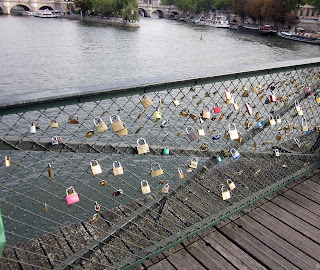 I don't think much of it at all, but judging from the number of locks I would seem to be in the minority. From the Pont des Arts we walked the short distance to the Louvre, where I pointed out the Tuileries Gardens, and the fact that at one point there had been another palace there, where Louis XVI and family were kept as virtual prisoners during the Revolution. I also pointed the the Place de la Concorde, at the end of the scenic but lengthy walk (time, again), which was known as the Place de la Revolution during the Reign of Terror, during which Louis, Marie Antoinette, Danton, and finally even Robespierre himself, were all guillotined in that bloody Place ("ah") now of necessity re-named Concorde. 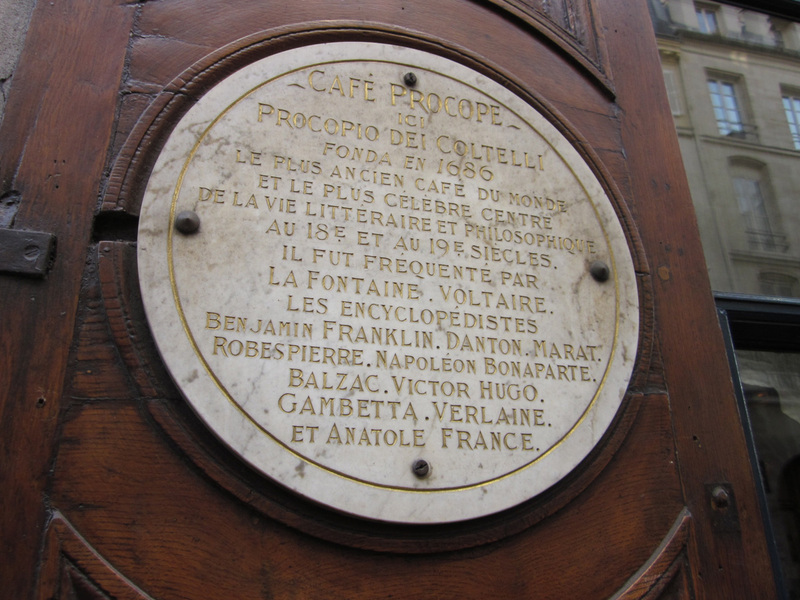 We crossed the Rue de Rivoli (it's a lengthy rue) to finish our tour as I pointed out to the students the Comedie Francaise, divided into two groups during the Revolution, one pro, the other anti the conflict. 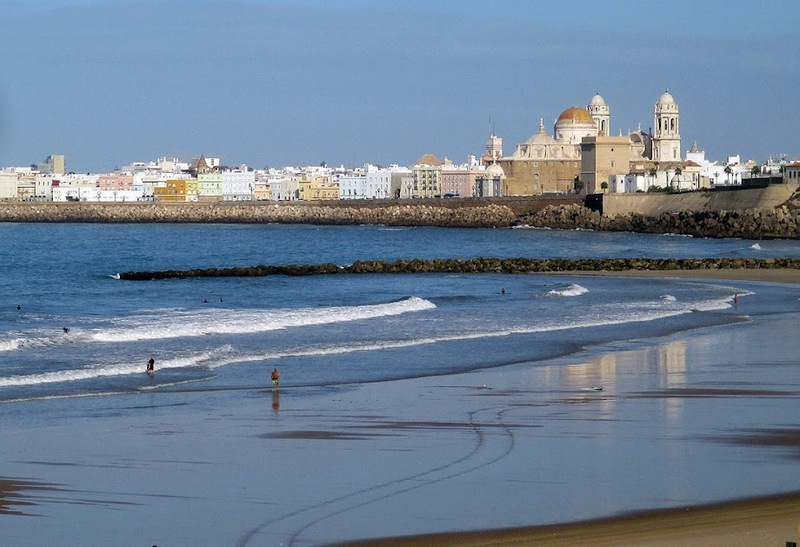 Nearly all of them came very close to a tumbril ride down to the Place de la Revolution, but most were spared by...well, by a story too long to tell in this bloggo, which has become anything but piccolo! And to our final destination, the gardens of the Palais Royal, which had become a pleasure garden in the eighteenth century, housing shops, cafes and courtesans, but also a meeting place where speakers including Camille Desmoulins shouted for Revolution...and got it. Which goes to show the efficacy of the phrase that begins, "Be careful what you wish for..." Desmoulins went to the guillotine on the same day, probably in the same tumbril, that Danton did. 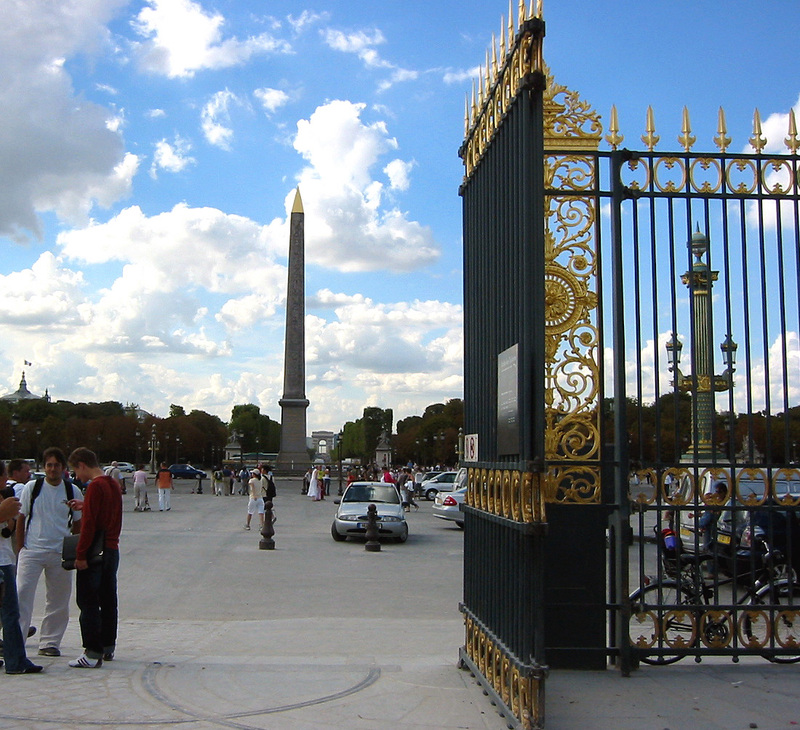 I felt the need to write about the French Revolution walk in more detail than I'd originally intended, also to show the photos of the walk. But it's forced me into a two-part bloggo. 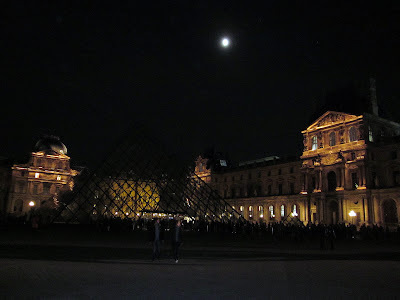 I'll end with this note: After the walks the students went back to the hostel, from which many re-emerged to head to the Louvre, which offers free admission to people of their age from 6-10 pm on Friday nights. I checked in on them and attempted a few night photos which turned out better than I'd thought they would. "If you get caught between the Louvre and moon-lit Paris..."
And then Bill and I, along with the other visiting faculty member Linda Heyne, and with ICLC operation manager Sarah Davies and her beau, went back to the Place des Vosges and had a delicious dinner at a charming restaurant called Ma Bourgogne. It was not until about midnight that I fell in a heap onto my bed and slept very soundly! More tomorrow on the second and last day in Paris!